January 27th to April 6th... sorry I haven't blogged in awhile. In February I was busy skiing, running and indoor rock climbing. When 7:30 PM on a weekday night came, instead of walking over to the local Starbucks in 20 degree Fahrenheit weather to write a blog post, I stayed in my apartment without wifi. 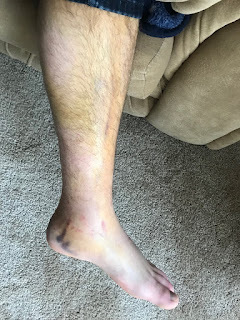 And for the last four weeks I've been in an air cast with two broken bones and two moderately torn ligaments, so I have not been going out at night. What happened? I've had some stress at work. Not a lot. Not nearly as much as I had at times in my previous job. The kind of stress that raises me to do a good job, to double check my work, that humbles me, and relaxed me when it eventually subsides, as it has in the past two weeks. Our company fired it's first person. He's a great guy. He was only with us for about a month. We aim to be people that "lead from the front" and my understanding is that he just wasn't the right kind of great at his job that we hoped. It was a bit of shock to most people, and morale definitely suffered. It's instigated a larger conversation about what our culture is, and what we want it to be. And it's started a dark joke (for me as a man) that we're going to fire all the men and hire all women. I've started interviewing people. I love it! I've interviewed six people I think one on one. I love it because I think I can learn something from everyone, so I try in my little 30 minute interviews to learn something from each person that we can use in our company, whether we hire them or not. Also, I've found a fair amount of the time that I would enjoy working with the person, but the person is not the right fit for the role or the company at this time. I have pretty high standards. Ideally you would only hire people better than yourself, and frankly, everyone I have voted we hire, appear to be able to do their future jobs excellently, and are better than me. I think hiring is the single most important thing that we do as a company, it will either make or break us. It can turn us into a ten, or a seven or a a twelve by how employees rate the company. You don't want to be the seven because you don't attract as high of quality candidates and you don't want to be the twelve because then on a conference call a person might not realize he is not on mute and say, "I'm going to kill myself." Which is both a true story from a 200 person conference call, and a saying that was typical at that company, which former employees say was not well addressed by management. Quick tangent, I never applied to MIT, in part because it has a suicide rate. I can take things really hard sometimes, and I don't, or didn't, want to put myself in a situation where suicide was a thing that happened. Instead WPI was a great choice for me. At the time the marketing slogan was, "The university of science and technology. And life." We made fun of the "And life" all the time. However, people would agree that there was in fact support for us and our mental health. At the time WPI had something like 16 years or 24 years or some long stretch of time without a suicide of a student. As far as I know they still have not not had one, although there were two deaths while I was there, one pedestrian hit by a car and I forget the cause of the other, I think it was cancer or another medical tragedy. My company has also been ramping toward our first full power customer deliveries, and frankly, we're not ready to deliver a full power product to the customer. So there is a little stress as we fix the bugs and optimize the system with looming deadlines. But again, it's a pleasant level of stress. We haven't missed a customer required deadline yet, and still have months before we might possibly. Then we currently have a bit of a slow 2019 for deliveries, so we will likely be able to iron out more hiccups as production slowly ramps up. Plus, I work with a great team! We really have some of the best in the industry and I am confident we will deliver. If I have any specific unique skill at our company, it's that I can deliver. When it comes to getting a product to a production state I've been through the wringer, and seen several different types of programs. I've been through four different production launches, three quite small, sub million dollar programs with less than 40 new parts, and one $150 million program with something like 5000 parts. I've also been early design stage on two $2-10 million programs with 100-500 new parts at my previous company, which would be where our two current projects are in terms of part count. 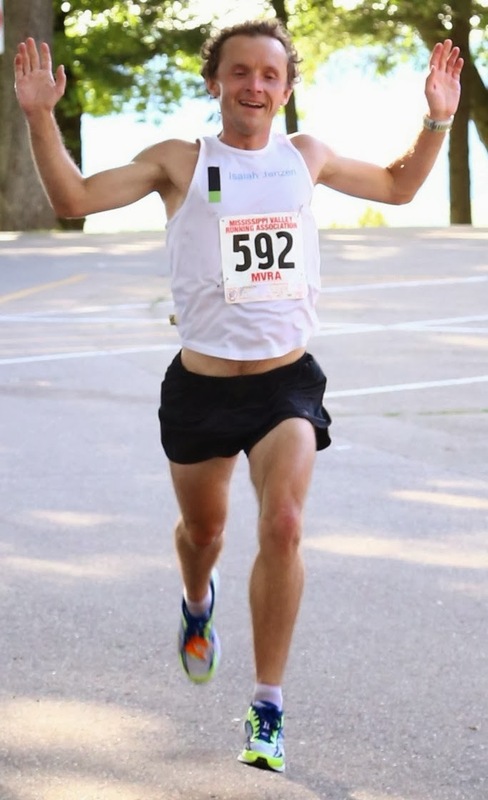 Running was going well, until I broke my leg and partly tore my ligaments. I'm hoping to be able to run again in late May, and walk without a cane in late April. I think that my focus athletically for the rest of the year will be becoming healthy and strong, by summiting the 26 remaining 14ers I have left, rock climbing a couple long technical routes, and taking a go at Nolan's 14 for the third time. Skiing, I made eight resort days with my Ikon base pass, and eight backcountry days, and one cross country skiing day. I'm hoping to get out on a lift one more day before all the resorts close, simply so that I am not afraid of skiing next season. Of course, worst cast scenario, I simply hike up a snowfield in June and ski 500 feet. We are on the same page with our Christian faith, and eventually worship at the same alter. So what happens after I meet a person that meets those requirements, but I don't feel captivated and infatuated? So far my solution is keep seeing her, but not be in a rush to make babies with her. My motivation to date goes up and down. I've had a few thoughts recently that maybe I really want a great climbing and running partner more than I want a romantic partner. Probably not what I really want, but it has gone through my head. Plus it's a false dichotomy, it's not one or the other, I can possibly have both. I hope your life is going well, and again someone feel free to post this to my Facebook wall as I haven't logged onto Facebook in 2019 and might go the whole year without using that data promiscuous company. Back in college I read the first couple chapters hanging out in a book store or a friend’s house one night. It was nice, but not nice enough I bought the book. Well, my church is going through the book in Bible study and sermons during Lent and they were giving away free copies, so of course I picked one up and started reading it. Wow! It’s a good book! I really was not expecting much. I mean, how much 2000 year old evidence could there be? I was expecting him to cover maybe 10 sources or pieces of evidence, but when you add them all together you have dozens of points, and that’s just in his simple book for laymen. He lists dozens of sources with more thorough analysis of the individual pieces of evidence. I’ve been a Christian my whole life. Sure I have doubts from time to time, but it’s always been a constant. My Christian experience, and simply knowing how quickly the early church grew despite persecution from the Romans has always been enough evidence for me. It was never important to me that Josephus or Tacitus wrote about Jesus. The fact that only a few of the disciples wrote down the story of Jesus, and not all of them never bothered me. Of course, in today’s world, were the three years of Jesus’s ministry to happen, everyone would write three books about his life. However, for the first century to have the four gospels, plus a few letters from the original 12 disciples, copied and translated remarkably consistently from a group of 12 people where a few might have been illiterate, there was no printing press or internet, and both the Jews and the Romans were trying to squelch Christianity, by historic standards is as strong as evidence comes. For example, Thallus wrote a three volume history of the Mediterranean, which would be an important text if it were found, but it hasn’t survived to modern times. So why do we have the New Testament? Probably because the people spreading it were incredibly convinced that this was a really important story to tell. Who might possibly enjoy reading the book? Good question, honestly, anyone middle school and older, Christian or atheist. It’s an easier read than the Bible and provides a context to the Bible that the Bible itself does not give. It doesn't have all the answers, and honestly we never will. If there is any change from me after reading the book it is that I might talk about God and Jesus more. Instead of being nervous of being ridiculed or challenged for my faith, at the moment I feel more like, ‘…whatever, and here is point A, B, C and D for your objection.’ What I’ve realized is that it’s easy to attack faith, and people have been attacking Christians (and every faith) for years, but it’s a lot harder to attack evidence, and people can't really dispute the evidence of Jesus and his resurrection. For example, why did the people who knew Jesus in large part die claiming he was raised from the dead? It's one thing to die for a faith as people still do today, but it's another thing to die for a faith that was started by a person you knew. In other words, if the original disciples knew that the story of Jesus was false, they would not have died committing to it. I’ve been investing in the stock market in individual companies since 2011, and one of the first companies I bought was John Deere. I only bought a little, but I still own it and it's increased in value quite a bit. They send out a nice annual report every year, and attempting to be the diligent investor, I’ve read most of it. One thing that caught my attention years ago was the major ownership. 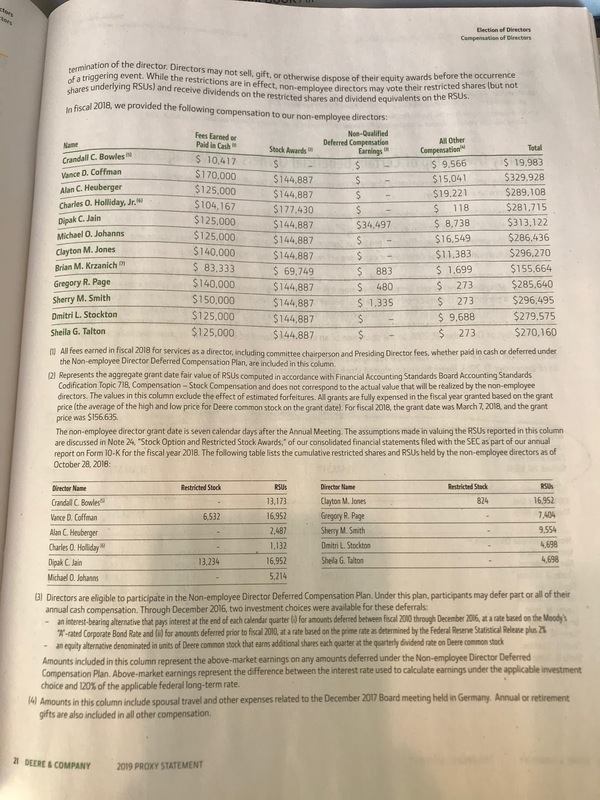 As of the 2018 annual report which was just sent out in January 2019, there is an organization called Cascade Investment L.L.C. 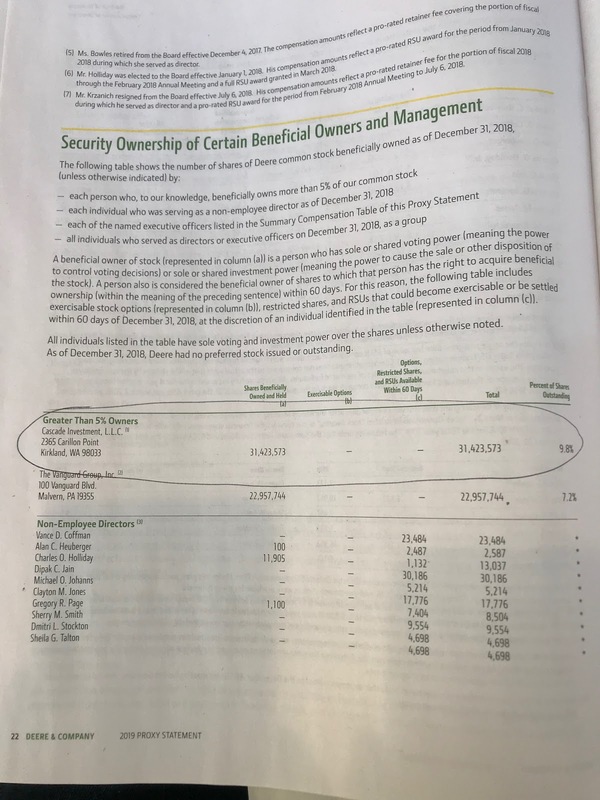 that owns 9.8% of John Deere on page 22 of the annual meeting and proxy statement. Turns out, it’s one of Bill Gates investment firms. So Bill Gates owns owns 31,423,573 shares. 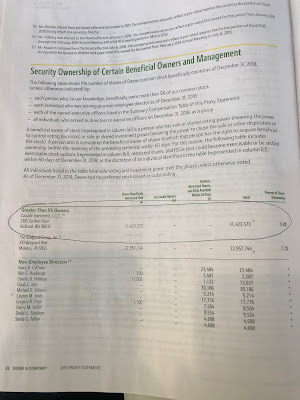 In 2018 Deere paid $2.58 in dividends per share of stock. That comes to $81,072,818.34 that Bill Gates made in dividends just for owning such a large share of the company. To the best of my knowledge, he’s basically all hands off and doesn’t really direct the company at all. However, I’m pretty sure that somewhere up the ladder phone conversations happen, and Microsoft will be used at Deere indefinitely. The CEO, who does a good job, made $18,525,667 from employment in 2018. In other words, the CEO who works hard, certainly ends up answering calls and emails on the weekends and at night, made less than 1/4 of what Bill Gates made, just for owning such a large portion of the company. That’s inequality! I’ll call that inequality #1 for the day. 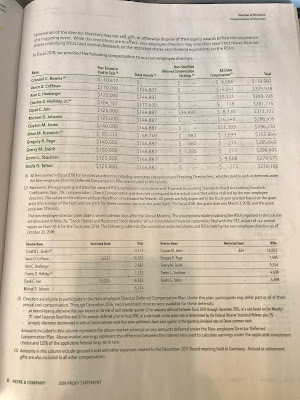 Inequality #2 is between the CEO and the next four highest paid officers. The next four people made between $4,273,996 and $4,633,762. That’s less than a quarter of what the CEO makes. I am 100% a fan of CEOs being paid well, but is it really appropriate for the CEO to make over four times as much as the division directors? I mean, 50% more or double would still be a huge step up. I mean, for the average person, if they had a salary making $1.5 million a month I don’t think they would last very long, probably only a number of months, at the most a couple years. I just don’t really know what you do with that kind of money. An aside, if the CEO was fired, for cause, meaning he did something wrong, he would still get over $42 million dollars. Inequality #3 is for the board of directors. While they certainly serve an important function, basically keeping the CEO and senior leadership from going off track, it is a part time job, something that probably takes 2-4 days per month on average. Let’s just say that it takes a total of two months of full time work per year. 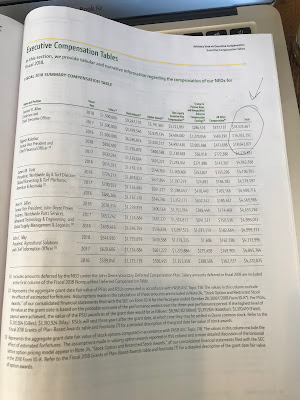 For the members that served a full year, they were paid $270,160 to $329,928. Hands down, I want that kind of job! You could sit on one or two boards, make half a million dollars a year, and work less than six months a year. I want to be on a board of directors! The final inequality, #4, is between the median employee and the CEO. 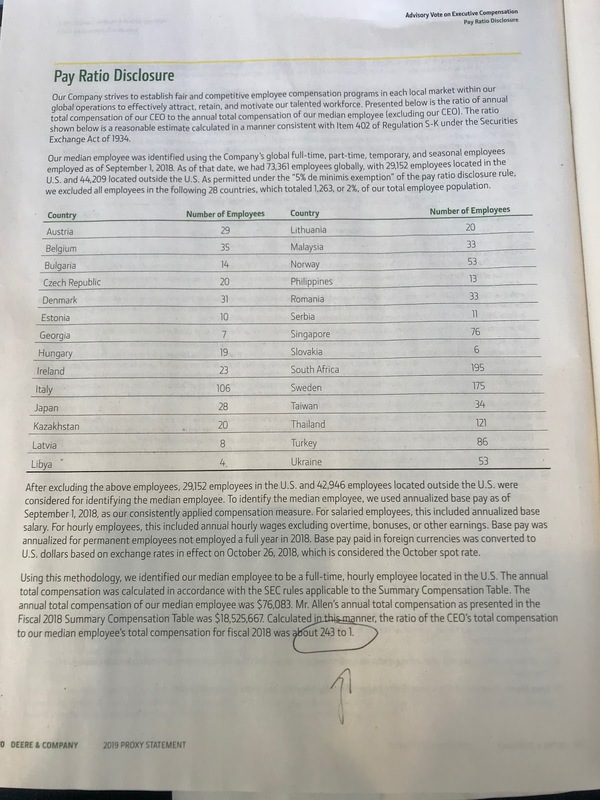 The median employee was a US based employee who made $76,083. That’s 1/243rd of what the CEO made. In other words, the CEO is doing the work of 243 median employees. 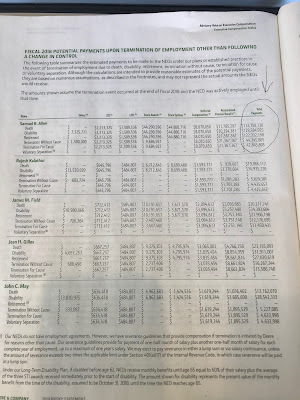 What is interesting about this, is that as Deere expands outside the USA the current ratio of 29,152 employees in the USA and 42,946 outside the USA will become even more lopsided. Eventually the median employee may very well be an engineer in India, at which point the salary will be somewhat less than $76,083. As I’ve thought about financial inequality probably over a thousand hours I can’t see the reasoning to pay any one person more than 10 times any other person. Ten times the median USA income is a pretty large income. You can afford to fly first class wherever you go. You could live in a million dollar home. You could buy that fancy sports car. You could buy a vacation home. I don't see how you can really justify an income above $10,000,000 per year on a value added basis. I will say, I do think that founders of companies, like Steve Jobs and Bill Gates and Jeff Bezos deserve outsized rewards for the disruption and innovation they implemented. However, there is a difference between being a manager and being a founder. A manager likely took the safe route, at an established company and worked his or her way up. A founder risked going bankrupt to corner a market that likely didn't really exist when the company was started. 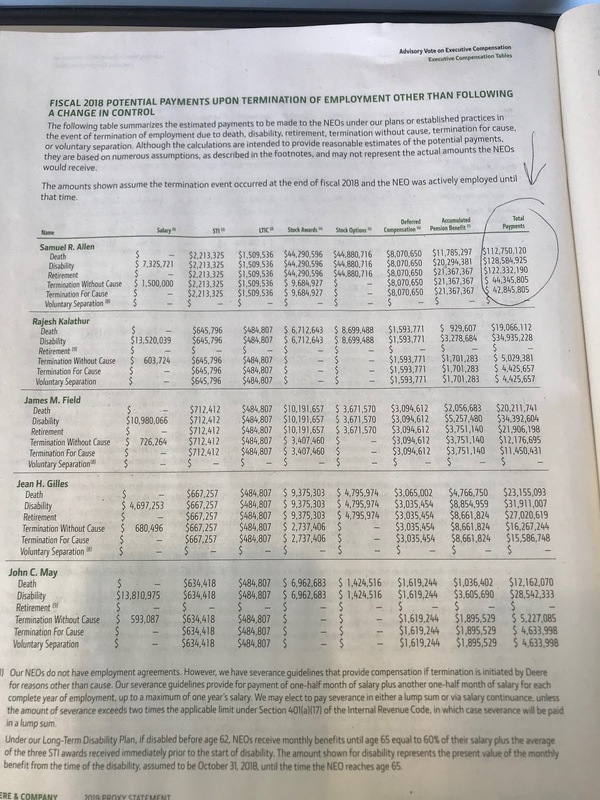 In closing, Bill gates was paid by John Deere 1,065 times as much in dividends alone, not counting stock price appreciation, as the median employee and more than four times as much as the CEO at John Deere, simply because he owns the stock and not because he worked on those Saturdays when production was behind schedule, or did any work at all actually relating to Deere. That is inequality. Again, I am a shareholder of John Deere. I think Sam Allen is doing a really good job. Bill Gates is donating more money to charity than probably anyone in the world, which is great. I do think people in corporations responsible for making big decisions should be paid very well. I think founders of companies like Microsoft should be rewarded for their innovation. As for my politics, I'm a registered unaffiliated voter, I like to think I'm independent. 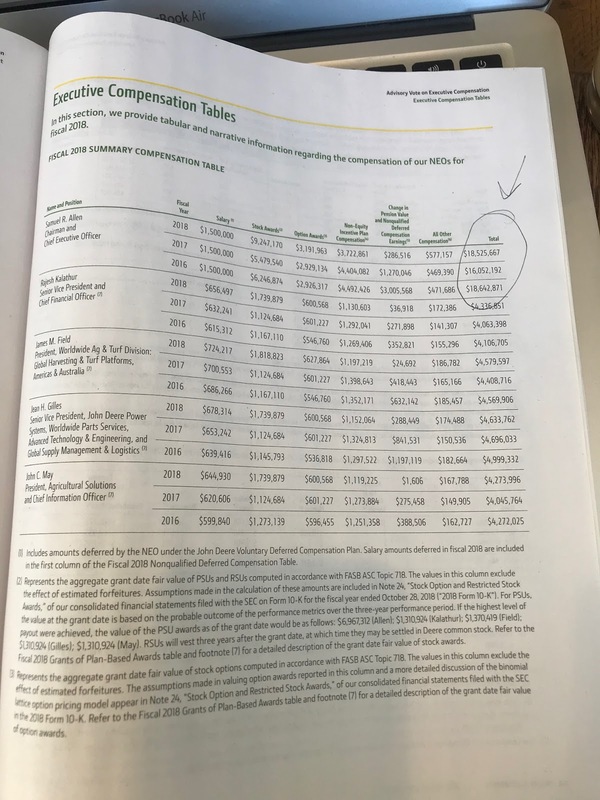 I just look at these numbers and get frustrated, and want to go into politics to revise the tax code and lower the price of healthcare or at least make the prices more transparent. I'm privileged. My parents gave me opportunities when I was young, helped pay for a chunk of my college expenses, and (along with my extended family) bailed me out in 2010 when I couldn't find an engineering job. I'm good at what I do. I'm not the best configuration engineer in the world yet, but I'm good. Still, I expect that I will only make $3-5 million dollars in my entire working career. There are thousands of people that stand to inherit more than that. And my income is above the median and above the average, for whole households! So when I struggle to save money and pay all the medical bills after having a broken leg and pulmonary embolism in six months, how is the median person or family supposed to afford a safe place to live, a car, food on the table, and a little entertainment in this country?! Not sure what "I'm okay" means, but I'm alive. I broke my leg on the first ski run of the day March 9th at 9 AM at Copper Mountain. I broke my left tibia malleoulous, and fibula near the top of my boot. At the same time I partly tore my deltoid ligament and syndesmosis ligament. I've lost my inReach, somewhere between Golden, Canada and Longmont, CO.